Twenty years ago, the International Association of Home Staging Professionals® (IAHSP®) was birthed from the knowledge that our industry needed a professional association to help guide it moving forward. Barb Schwarz knew the importance of professional associations and had the foresight to establish the world’s first and to date, the largest Home Staging Industry association. As we look back at how we have grown and changed, and look towards the future, we are very excited about what lies ahead. Not only has IAHSP® officially expanded across the globe with our IAHSP®-EU Association, country chapters in Latin America, Canada and soon to be China, Africa and Australia, we have aligned ourselves with other reputable association leaders throughout Europe, the UK and Japan. Today we have people from all continents reaching out to us as the industry leaders to join a professional network for resources and support. Our educational events now span across two continents, with more to follow. We have established relationships with companies eager to work with our members and approved educational providers offering quality education for industry professionals. IAHSP® truly is a Global Force for the Home Staging Industry™. As IAHSP® International Chairwoman, my commitment to our members moving forward is we will be a resource for success, education and industry standards for all professional Home Stagers worldwide. Our International Leadership Team and entire IAHSP® International Board proudly serve our members to ensure the longevity of our association. At the heart of IAHSP®, We are not just an Association, We are a Family™. Every member is important to us and we aspire to see them succeed and thrive. Ultimately, we hope you believe and feel IAHSP® is Your Home in the Home Staging Industry™. 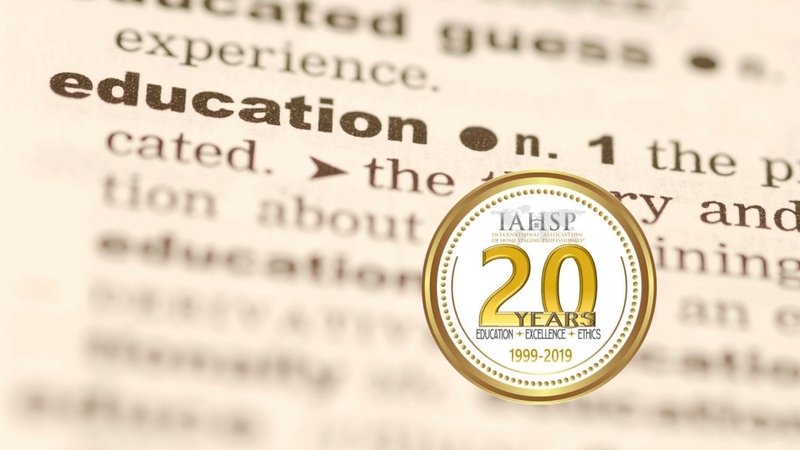 “HAPPY 20TH ANNIVERSARY TO IAHSP AND ALL IAHSP® MEMBERS! I will always remember that as I began to Write and Present the First Home Staging Educational Courses in the World I knew as a very important part of my Greater Mission, after inventing Home Staging, was to Found a Home Staging Association! Why? Because I knew that it was absolutely crucial to be able to provide continuing Education to all Professionally Trained Stagers to Grow and Support the Staging Industry that I Was Decided to Build. I truly could see as an important part of my Vision that we would need to be able to provide Continuing Education through varied Events, Meetings, classes and more. To Me this was not a choice but rather a VERY IMPORTANT NECESSITY. I also was propelled to name the Association I Founded not by a National title but rather with the words The INTERNATIONAL ASSOCIATION OF HOME STAGING PROFESSIONALS. Which are the Letters of IAHSP®! Holding True to my Purpose and Mission of Staging The World it had to be an International Association, not a national one, to include Stagers and Homes all around the World. As I Founded our Wonderful Association I worked for 17 Years to Build us to be Strong, Professional, Caring. Educated and a Loving Family of Members that We Are. I am so very proud of each of you as the Important members of IAHSP that you are. Thank you for your care, your integrity, your dedication and your love of Staging! TOGETHER we are Changing Lives for the Better by Staging the World through IAHSP®!